Okay, so while I'm totally horrible and trying to stick with watching horror movies, I have a bit more of a tolerance for horror comedy movies. This is not to say that I don't still fall prey to little jump-scares and other such surprise moments in these comedic movies. I'm a big of a loser that way. But hey, this still counts as part of my efforts to review more horror movies in line with the coming Halloween holiday. Gremlins is one of those classic 1980's movie franchises that kinda only really made sense during the time. I mean seriously, could you think of selling a movie like this to modern movie audiences? I highly doubt that it would manage to get very far. But for one reason or another this movie had a bit of a charm all on its own. It celebrated a lot of the tropes of other horror movies and stories of a somewhat scary nature and brought things all together into, well, this. It had a cute protagonist of sorts and of course totally nutty antagonists that made the most of the practical effects department behind this movie. And it was campily glorious. 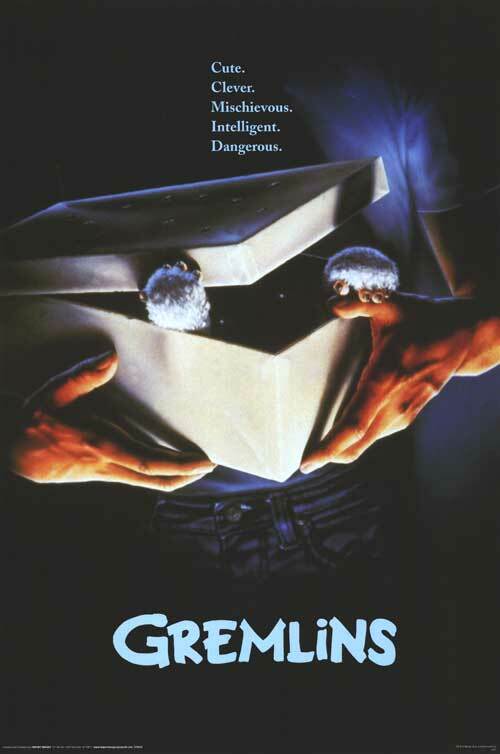 Synopsis: Gremlins is a 1984 horror comedy movie directed by Joe Dante with a screenplay by Chris Columbus. The movie spawned a sequel and it probably inspired a number of movies about similar small monsters including the likes of Critters and Ghoulies. So Randall (Hoyt Axton) decides to find an unusual Christmas gift for his son and ends up wandering into some obscure Chinatown antique shop. There he ends up selecting a Mogwai, despite the protests of the shopkeeper. But of course he eventually relents and sells the little critter, but of course he provides a list of key instructions related to the care of the creature. It must never be exposed to bright light (especially sunlight). It mustn't get wet. And it should never, ever be fed after midnight. Randall names the little creature Gizmo and brings him home to his teenage son. His son Billy (Zach Galligan) is happy enough to receive Gizmo and is given the three rules to remember. But as is the way of these things, a glass of water is accidentally spilled all over Gizmo, triggering the creation of five more Mogwai that sprout out of Gizmo's back. And while Gizmo was all cute and loveable, these five new creatures seem to have a slightly more mischievous disposition. And of course their antics are focused on breaking even more of those rules to help further their own plans. The first half of the movie is hard to take all too seriously, as is by design. I mean seriously, in their original furry form, the Mogwai are more comical than anything else and the movie seems to center around little antics just to break the rules. And that doesn't sound like much of an issue - they're just some harmless little rules, right? But once the "evil" Mogwai get fed and they evolve into their, well, monster state, then things get pretty serious. And you have to hand it to the effects team - those gremlins really came out well. They're both disgusting and yet still capable of being humorous. And sure, if you were faced with a mature gremlin in person, things might be completely different, but on-screen they totally worked. And I have to admit, I didn't sleep too well after watching this movie precisely because of those gremlins. The movie gets pretty violent later on, and I can imagine some parents being concerned about this sort of thing. This isn't some little kiddie movie after all - this still has good moments of horror movie gore, even though some of the bits end up being comical. Literally bloody, but still funny. And the movie doesn't rely solely on the humans for a final solution. One can't discount the potential contributions of little Gizmo. He's more than just the carrier for these killer Mogwai. He's a little hero on his own, although how much you'll invest in a cute furry hero who doesn't speak is anyone's guess. But hey, it sorta worked for Ewoks, right? This movie is hardly a favorite, but it's the sort of thing that you don't mind watching again on some whim on a weekend. It's sort of like Archie comics - almost all of us have read them at some point, but we rarely admit to having done so. Or continue to do so? Gremlins managed to hit that sweet spot with the horror aspects and the comedic stuff. It never goes all the way to laughing out loud sort of funny though - that's what the sequel was for. So the movie gets 4 Mogwai breaking the rules out of a possible 5.